← A Conventionalized Magnolia In The Westcott House: Contentment Itself! After months of trying to see it, I was finally there. And then it started raining. The unrelenting downpours looked as if they would go on forever, but we decided to wait it out. Finally, the rain stopped. We approached an iron gate with Mediterranean-style gateposts, at the end of a long fence, bordered with a row of begonias and hostas, almost completely hidden by trees. What came next was a scene straight out of Frances Hodgson Burnett’s The Secret Garden. I felt the same way when I entered this wonderful garden that’s one of the loveliest places you could imagine. 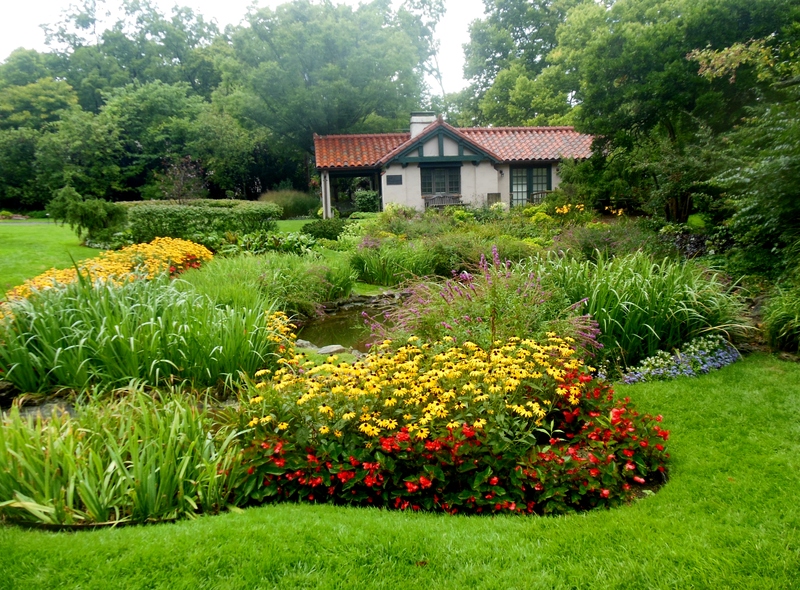 Smith Gardens, a public garden in the Dayton, Ohio neighborhood of Oakwood, is located on less than one acre. It is the former home of Carlton and Jeanette Smith, who began designing their garden in the 1930s. After the couple gave their home and garden to the City of Oakwood in the mid-1970s, the neighborhood’s horticulturist and a team of residents began caring for this treasure. A brick walkway leads past thickly planted beds of ornamental grasses, flowers, hostas and trees, all retained by ivy-covered stone walls. 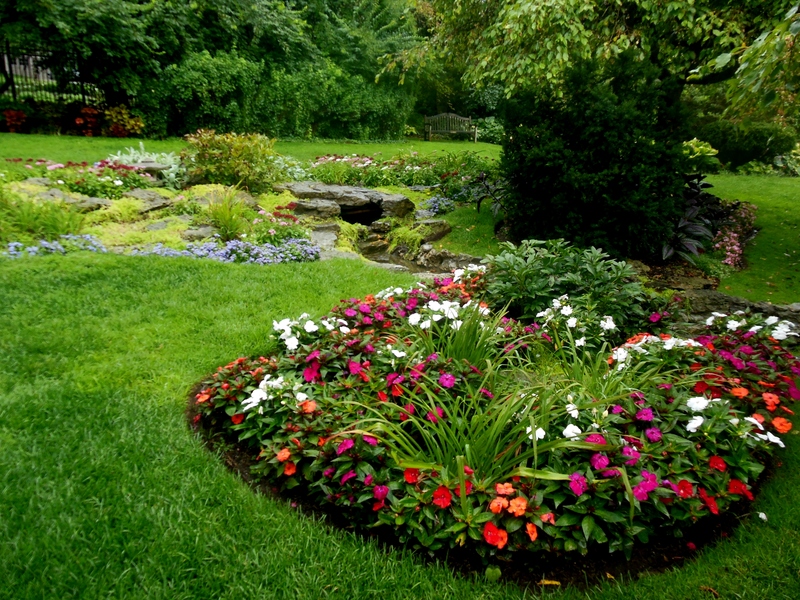 It ends at a lush landscape in which continually blooming beds of colorful annuals and perennials meander under trees, through carefully placed rock gardens and beside a stream that ends in a small waterlily-filled pond. Evergreens ensure the garden’s attractiveness in all seasons, following Mr. Smith’s wishes. Thousands of spring-blooming bulbs are planted each fall. Still more annuals are selected and planted in varying ways each year, ensuring that visits to the garden will never be the same. 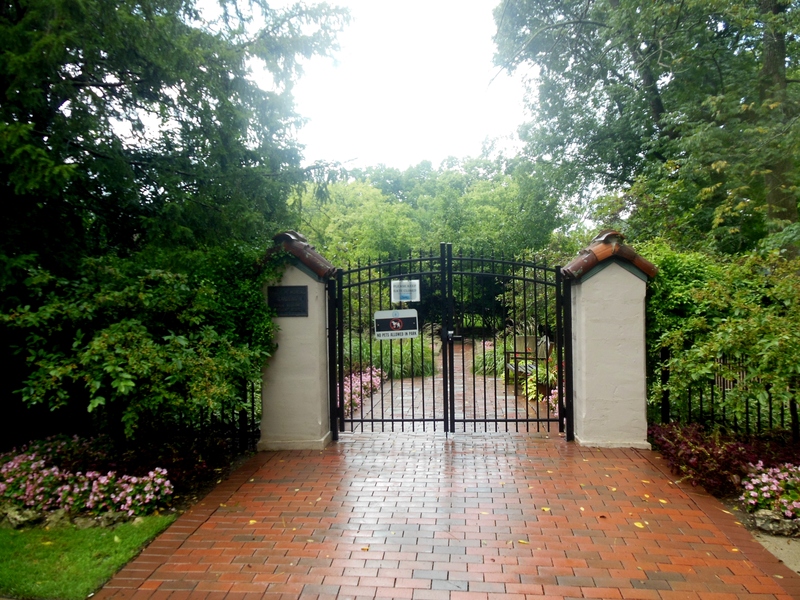 To find Smith Gardens, travel on Far Hills Drive (Ohio Route 48, known as South Main in Dayton) until Oakwood Avenue meets Far Hills, then turn west on Oakwood Avenue. Continue a few blocks, until you come to Walnut Lane. You’ll see the garden’s fence on your right. Smith Gardens is open daylight hours, seven days a week. Green Byways: Garden Discoveries in the Great Lakes States, by Sharon Lappin Lumsden, includes information about Smith Gardens and other unique public gardens in the region. This entry was posted in Dayton, Gardens. Bookmark the permalink.